Alex Romanowicz worked on a door in Cambridge on a street with many home construction projects under way. There was a time, not long ago, when home renovations slowed to a trickle, with homeowners wary about making anything but the most essential fixes. Now, they are not only willing to spend, but to spend big. Consider David Sinclair and Sandra Luikenhuis. The couple knew it was time to renovate two bathrooms in their Chestnut Hill house when water started leaking. But they used the opportunity to transform the dated bathrooms into sleek, modern spaces, finished with high-end materials like teak and quartz. The cost was significant: about $50,000 per bathroom. The growing economy, rising home values, and low interest rates are giving homeowners the confidence and cash they need to raze walls, add rooms, renovate kitchens, build decks, paint siding, and spend on other projects to spruce up their homes. 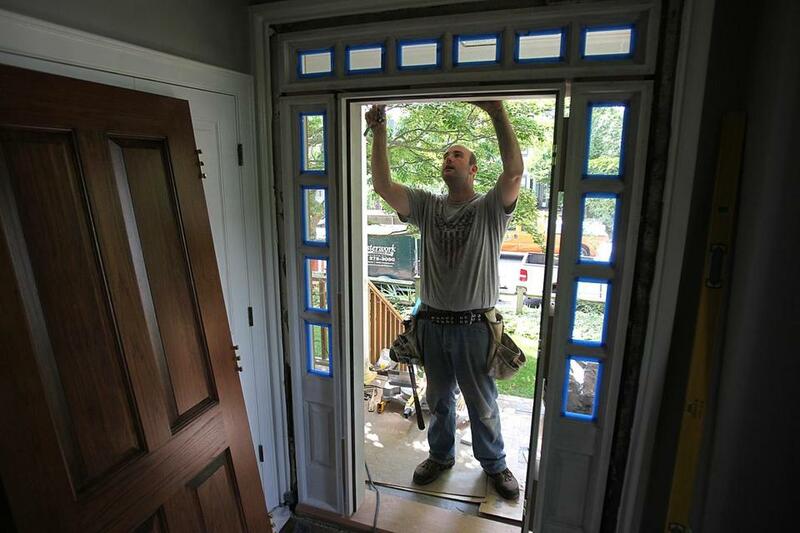 Business for contractors and home improvement companies across Massachusetts and the country is on the upswing as the remodeling industry, crippled in the last recession, rebounds. At firms like New England Design & Construction in Roxbury, the projects are coming so fast that there is a waiting list of about three months. 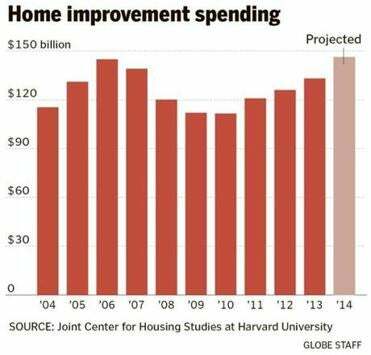 Spending on home remodeling, which peaked at about $145 billion in 2006, is on track to surpass that high by the end of the year, according to figures compiled by the Joint Center for Housing Studies at Harvard University. This growth has also meant more jobs for carpenters, painters, plumbers, electricians, and other construction workers. In Massachusetts, the increase in remodeling activity has contributed to a recovery in overall construction employment, which has gained about 18,000 jobs over the past four years, about half the number lost in the recession. Kermit Baker, director of the Remodeling Futures Program at the Joint Center for Housing Studies, said rising home values are contributing to the home improvement boom by giving owners confidence that investing in their homes today will pay off when they sell. During the downturn, when property values plunged and unemployment soared, consumers limited their spending to projects that could not be delayed, such as leaky roofs. The median home price in Massachusetts has climbed nearly 20 percent since sinking in 2009, according to data from the Warren Group, a Boston real estate tracking firm. Home prices have climbed fastest in Boston and surrounding communities. Rising home values in Wellesley helped Lisa Laich and her husband, Richard Lee, with their decision to spend about $60,000 to build a farmer’s porch, repaint, and add landscaping to their 1930s Colonial-style home. The house has appreciated about 20 percent since they bought it two years ago, allowing them to get a home equity loan to cover half of the cost of renovations. As homeowners tap that equity, such spending has boosted sales of home improvement products, from lumber to paint to appliances. Both Lowe’s and The Home Depot, the home improvement store chains, said in financial filings that they expect sales to rise 5 percent this fiscal year. IHS Global Insight, a forecasting firm in Lexington, projects that overall retail sales of home improvement products will grow 6.5 percent this year and another 7 percent in 2015. That contrasts sharply with the dark days of the recession, when spending was low, projects were few, and competition among contractors was fierce, forcing companies to slash prices to win jobs and to lay off workers to cut costs. But as the housing market and the broader economy have improved, so has business for contractors like Timothy Williams, co-owner of Principal Builders in Hyde Park. Priyanka Dayal McCluskey can be reached at priyanka. mccluskey@globe.com or on Twitter @priyanka_dayal.